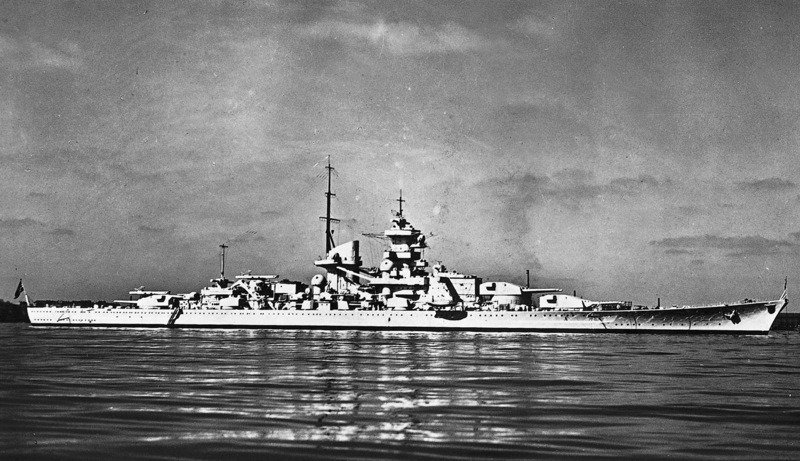 The battlecruiser Gneisenau was launched in December 1936 and completed in May 1938. She was upgraded in the following year and made her first Atlantic sortie, with her sister ship, Scharnhorst, in November 1939, sinking the British auxiliary cruiser Rawalpindi. She was damaged by gunfire from the British battlecruiser Renown off Norway on 9 April 1940, but on 8 June she and Scharnhorst sank the British aircraft carrier Glorious and her escorting destroyers Ardent and Acasta. On 20 June 1940 she was torpedoed by the Royal Navy submarine HMS Clyde off Trondheim. In January 1941, again with the Scharnhorst, she made another sortie into the Atlantic, the two sinking 22 merchant ships – a moderately successful action. On 6 April 1941 she was torpedoed by a British aircraft at Brest, and further damaged by aircraft bombs four days later. In February 1942, with the Scharnhorst and the heavy cruiser Prinz Eugen, she made the famous dash through the English Channel from Brest to Germany, being damaged by a mine en route. On 27 February 1942 she was damaged by bombs at Kiel, after which her guns were removed and she was decommissioned. She was towed to Gdynia and sunk as a blockship there in March 1945. Her hulk was broken up in 1947–51.